Chemical equipment. 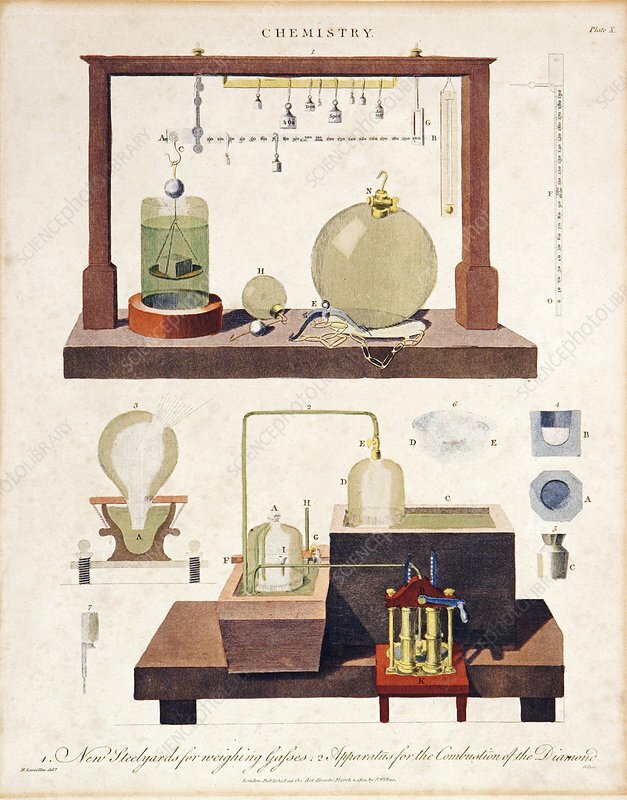 Early 19th-century artwork depicting a two sets of devices and instruments used in chemistry experiments. At top (labelled 1) is a steelyard balance and weights being used to weigh gases, with a thermometer also present. At bottom (labelled 2) is an apparatus used for the combustion of diamond. Sunlight focused with a lens causes a diamond to combust. The only product is carbon dioxide, proving that diamonds contain only carbon. This is Plate X of a series on modern chemical apparatus published in London in 1801 for the 'Encyclopaedia Londinensis, or Universal Dictionary of Arts, Sciences, and Literature'.